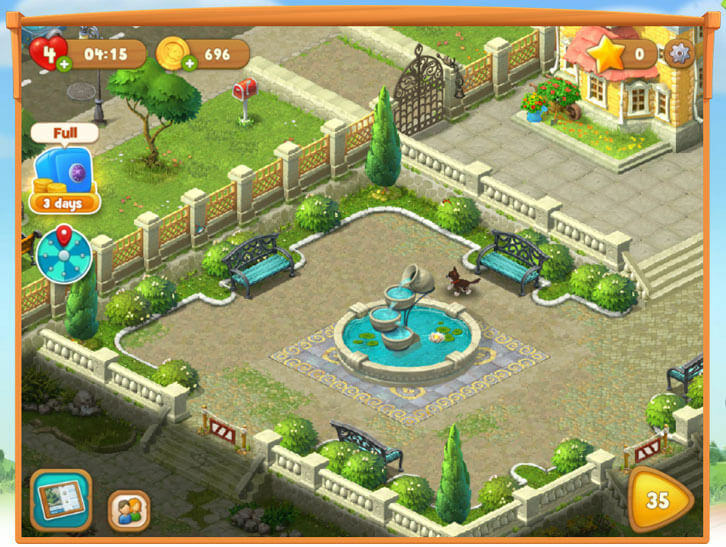 Changes We’d Like to See in Gardenscapes: New Acres Article - Virtual Worlds Land! Rate this Article After playing the game for quite a while, we’ve drafted up a range of suggestions that we’d like to see implemented in Gardenscapes: New Acres! Being among the best match-3/building games doesn’t mean that Gardenscapes: New Acres is perfect the way it is. There is still room for improvement and these are some of the suggestions that we have in mind! Now, the most important change that we think is necessary for Gardenscapes is giving players more opportunities to win or obtain free boosters and coins. Granted that you can get some from spinning the daily Wheel of Fortune, you can only win anything significant only if you’re lucky. So, to make it win-win for the developers and the players, it would nice to be able to say watch video ads (for a limited number of times daily) for more coins or to speed up tasks that take hours to complete. As a kind gesture, the developer could also add in clickable or tap-able birds that fly across your garden from time to time. Clicking or tapping on these birds will earn you small amounts of coins. They could even give players something other than match-3 games to play, other mini-games for example, in exchange for some extra coins. The mini-games would help break the monotony of the game as well, but it is crucial that this aspect remains completely optional. Players wouldn’t appreciate being forced to play some other mini-games. Do you know what else Gardenscapes sorely need? Achievements, that’s what! Honestly, I'm quite surprised to see that the game has no achievements whatsoever. It would be really nice to have some, especially achievements that will reward you with a bit of coin for completing them. Along the same line of thought, the developers may want to add in daily quests as well. The quests can include tasks like “exploding 10 Firecrackers” or “getting 5 Rainbow Blasts”, and in return, players can get some free coins. Aside from all the different ways the developers can let players earn more coins, they could also add a bit more animations to the many little objects around the garden to make it livelier, much like the lamps at the mansion – when you tap on them, they will light up. So, they could perhaps make a fish jump out of the water when you tap on the fountain or make your pet dog do some random yet impressive trick when you click or tap on it. Personally, I would suggest making these little animations feel like little Easter eggs for people to find and tap on, meaning that you don’t reveal in the patch notes which objects have been given extra animation, except to point out the “Easter Eggs” have been added, and simply let the players find out for themselves. Of course, this would also be completely optional. There are many other features that players have been asking for and that the developing team over at Gardenscapes is doing their best to provide, ranging from organizing more events to adding in more pets. It’s really nice that the team does listen to and read through the feedback they get from their players as well. For instance, they have recently removed timed modes for their games, allowing for a more relaxing gameplay. So, if you do have suggestions that you think the developers need to know, be sure to send them over. Who knows? Your suggestion may just be implemented in the next update! In the meantime though, you can enjoy playing Gardenscapes on your browser – just click here.